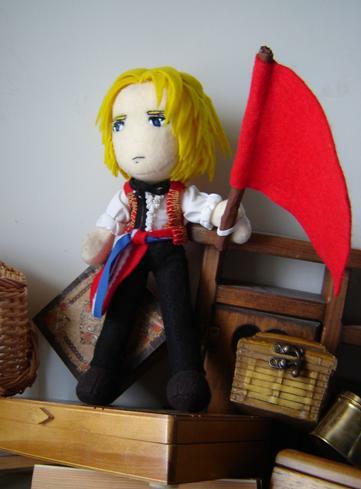 Made an Enjolras plush a couple years ago; comes complete with stoic Enjolraism, French revolutionary sash and the red flag of the workingman (which can be waved as desired because of his metal armature). Based on the traditional stage costume, of course. And less formal, because hey, why not, it's my plushie thread. Whateva, whateva, I do what I want. One day, I'd totes love to make all les Amis, but the problem with making plushies is that then you have a house full of plushies. If anyone wants one, give me a shout. Thus far I've sent plushie commissions to five different countries! ALWAYS HAPPY TO SEND TO MORE! Last edited by deHavilland on Wed Apr 10, 2013 4:43 am, edited 2 times in total. .....Yep Geronimo you are officially my new best friend! I may have to look into getting one of those, I've always wanted a barricade boy to cuddle! Oh! You're the one responsible for this! I saw this picture on deviantart awhile back. MamzelleCombeferre wrote: Oh! You're the one responsible for this! I saw this picture on deviantart awhile back. Cuddly Enjy!!! I want one once I have enough money!! 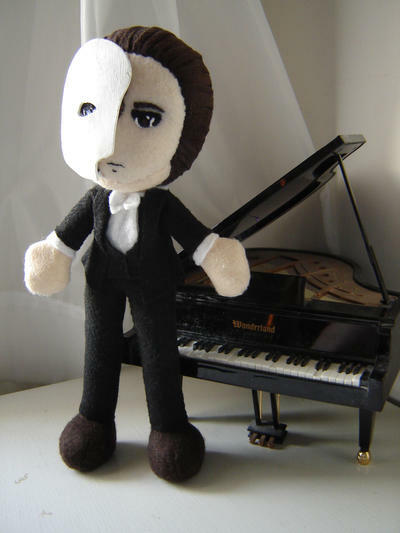 Enh, recently my Raoul plushie leapt out of my pile of plushies and begged me to fix him up. Since I'm going to that and since you know, Phantom is totally relevant to Les Mis Fanart, here's Erik while I fix Raoul. He's right gnarly under there, I promise. Oh, Geronimo, I love it! It's so...perfect. Almost adorable, in a creepy-demented-oh-look-scars kind of way. But it's really awesome. And I love the two different eye-colors. And so is your Enjolras, one, too, though I don't think I've told you yet, but they're just fantastic. Would love to see more, if you have them. The Erik one though, there's "carefully concealed" (not really, you can totally see it in the picture) velcro in his deformity to stick the mask on. Fun times. One thing I love is that you manage to make them look so darn huggable! Which a lot of fandom plushies I've seen don't. Like, dude, missed opportunity! Is that not the attraction of getting one?! But yeah, I'd snuggle up with an army of those! OT: I love your Zuko plushie. I can't decide what's cuter: your Erik plushie or the Enjolras plushie. Haha, I'm glad. I've literally never watched Avatar, so I was just going off of pictures. I know absolutely nothing about the character. ...man, all my plushies have frowny faces because people keep getting me to make frowny-faced characters. Sadly, Acaila, they're juuuust under the size of what I would consider to be supreme levels of huggability. For economic reasons. How tall are they ? That's a foot right ?